The 2019 ATP 250 in Doha, Qatar has Novak Djokovic as the star attraction (including a pairing with brother Marko for doubles), but resurgent veterans Stan Wawrinka and Tomas Berdych are still gunning for the title and have advanced to the quarterfinals. What will the rest of the tournament hold? Both of the seeds advanced to the quarterfinals, with world #1 Djokovic heavily favored against Georgian #1 Basilashvili. Both players have dropped sets this week, with Djokovic’s lost set to Marton Fucsovics a massive surprise. Presuming he’s motivated Djokovic should be too good in this matchup though, after beating Damir Dzumhur and Fucsovics. Basilashvili defeated Albert Ramos and Andrey Rublev. Tennis fans would love to see a revitalized Wawrinka making waves on tour. The Swiss veteran has a great shot against steady baseliner Bautista Agut after he upset Karen Khachanov in straights and followed that upset with a win against Nicolas Jarry. RBA has been solid, dropping just 5 games in each match (wins against Matteo Berrettini and Guillermo Garcia-Lopez). Wawrinka should be highly motivated though and I have a feeling he’ll rise to the occasion and notch an upset. Wins against Adrian Mannarino and Ricardas Berankis have lifted Lajovic to the quarters while Marco Cecchinato eased past Sergiy Stakhovsky and then got a walkover into the quarters. Cecchinato is still learning the ropes on hard courts, and though he’s very talented, Lajovic should have a slight edge. Both of these players have been disappointing lately, Berdych has been injured and considered retirement, but now he’s come back and earned wins against crafty veterans Philipp Kohlschreiber and Fernando Verdasco. PHH hopes to improve as a singles player this year and a stunning win against a listless Dominic Thiem, followed up by a three set tiebreak win against Max Marterer, will give him a lot of confidence heading into this matchup. Berdych is hard to read right now but he should be favored if he’s fit. This is Djokovic’s title to lose, but if he loses interest Wawrinka or RBA will benefit. I expect Berdych to make a run to the final at this point and fall just short, in what would be a huge result for him. The ATP 250 in Doha on hard courts to start the season is normally the ritziest 250 on tour but with most notably Novak Djokovic’s absence it plays host to one of the weaker fields it’s had in recent memory. ATP Next Gen stars Dominic Thiem, Borna Coric, and Andrey Rublev are presented with a great chance to make a run. Here is your full preview, with predictions. Having cemented himself in the top 5, Thiem leads the Doha field and will open with Evgeny Donskoy. Thiem needs to focus on keep himself fresher in 2018, and he’s also going to be playing with a target on his back all season. That said, he has the game to put away Donskoy and either Malek Jaziri or Aljaz Bedene, Jaziri tends to step up his play in the Middle East, Bedene, who is back representing Slovenia, had a great 2017 though and should be opposite Thiem, falling in round 2. French veteran Richard Gasquet opens with one of the oldest players on tour, Victor Estrella, he’ll then get another young gun in this draw, Stefanos Tsitsipas of Greece, or veteran Florian Mayer in round 2. The Greek won 4 matches on the main tour last year and will be looking for a big scalp to start the season, that said Gasquet is good enough when fit I have him defeating everyone into the semifinals, including Thiem in the battle of backhands. Another veteran hoping for a good 2018 is Tomas Berdych, the Czech won 35 matches but hoisted no titles in 2017 was forgotten for much of the season. He’s better than J.L. Struff, and either Paolo Lorenzi or wild card Gael Monfils though. Monfils had yet another season derailed by injury last year, shutting down after the US Open, he hopes to be fit to start 2018. Serbia’s Viktor Troicki faces ATP debutante Matteo Berrettini, while his countryman Filip Krajinovic takes on Peter Gojowczyk. Krajinovic had an incredible 2017 winning 71 matches in total (only 5 on the main tour) and reaching the ATP Paris Masters final. After tearing up the challenger tour look for Krajinovic to rise defeating Troicki and Berdych to reach the semifinals. Pablo Carreno Busta had a career year in 2017 but it still doesn’t seem like he’s appreciated enough. PCB has transformed into an all court performer, but despite his top 10 ranking he’s an underdog against Coric in his opening match. Coric is a talent but posted a below .500 tour record in 2017, PCB should defeat Coric and either Nikoloz Basilashvili or Thomas Fabbiano to reach the quarterfinals. Russia’s young gun Rublev is my choice to reach the semifinals, Rublev just beat PCB in Abu Dhabi and his path is Cedrik-Marcel Stebe, then a veteran, either Fernando Verdasco or Dudi Sela, before facing PCB or Coric in the quarters (most likely). The section with Albert Ramos as the highest seed is the weakest part of this draw, Ramos faces Guido Pella in a toss-up contest, Spanish veterans Feliciano Lopez and Guillermo Garcia-Lopez will square off, qualifier’s Mirza Basic and Stefano Travaglia are favored against Andreas Haider Maurer and local wild card Jabor Al-Mutawa respectively. Lopez did not have a great year last year but he still should be favored to survive and reach the quarters where he should defeat Ramos. I’ll take Gasquet’s guile and shotmaking to take home the Doha title over the young gun Rublev, this is a pretty open field so anything could happen, but look for this contingent to get off to a good 2018. The other top tier 250 this week takes place in Doha, Qatar, where three top 10 players make their Aussie Open preparations. Here is a preview, with predictions. The world’s top two have decided to start their 2017 seasons in Qatar, as this is once again a lucrative and strong 250. A match between a pair of veterans. Kohli is 3-0 in his career against the local favorite Jaziri but the German had a disappointing year on hard courts going just 9-8 on the surface in 2016. Jaziri reached the top 60, in large part due to his strong results at the challenger level. The Tunisian went 27-15 on hard courts and would love an upset win to start his year. Kohli is the clear favorite though. Kuznetsov posted a career best 29-21 record in 2016 and reached the ATP top 50. The now 31 year old Tsonga went 38-17, including a solid 19-9 hard court record. Tsonga should be in good enough form and fitness heading into this matchup to defeat the Russian with aggressive play, but this still not an easy first round matchup. World #1 Andy Murray, newly knighted, started his season in Abu Dhabi at an exhibition, and will open with veteran Jeremy Chardy, who he has a great h2h with, in round 1, with the Kohlschreiber/Jaziri winner likely in the quarters. dirtballer Gerald Melzer opens with veteran Paul-Henri Mathieu, while two more veterans, Nicolas Almagro and Paolo Lorenzi are also in this section. Almagro is 4-0 in the h2h against Lorenzi, but the Italian had a career year in 2016, making huge strides on hard courts. This isn’t a difficult section for Murray, who likely slides past Kohlschreiber to reach the semifinals. The Tsonga/Kuznetsov winner will get Facundo Bagnis or shotmaker Dustin Brown in round 2, Tsonga should be safe to advance until he runs into Tomas Berdych in the quarters. Berdych opens with qualifier Alessandro Giannessi, a 26 year old with limited ATP experience. His Czech counterpart Jiri Vesely should follow in round 2, as wild card Anil Yuksel is making his ATP main draw debut. The 23 year old Vesely remains a talent but he was a rather pedestrian 21-20 at the tour level last year. Berdych went 40-21, with 22 of those wins coming on outdoor hard courts in 2016. Berdych leads Tsonga 8-2 in the h2h, and should be the favorite to reach the semifinals. Novak Djokovic went 67-9 in 2016, despite his great successes on the season, he surrendered the world #1 ranking at the end of the season, and now has something to fight for in 2017. Djokovic’s early path is routine as Jan-Lennard Struff, and Horacio Zeballos/Florian Mayer aren’t likely to be more than hitting partners for the Serbian. Marcos Baghdatis has a 2-1 h2h against fellow veteran Radek Stepanek. Stepanek came through qualifying and their match should be fun to watch if you’re a fan of attacking tennis. Baghdatis went 26-23 in 2016, while Stepanek, now 38, went 33-15 overall, with a majority of his wins coming on the challenger tour level. Baghdatis is favored to win in round 1, with qualifier Mohamed Safwat or wild card Arthur De Greef to follow. The 26 year old Safwat has limited ATP experience while De Greef is playing just his third career ATP match at age 24. De Greef prefers clay, so Safwat should fall to Baghdatis in round 2, with Djokovic winning his quarterfinal against Baghdatis. David Goffin looks hungry to renew his success in 2017 after a 51-25 record in 2016. Goffin should ease past Robin Haase in round 1, with either Fernando Verdasco or qualifier Vasek Pospisil to follow. Pospisil had a terrible 2016, going just 9-22 at the tour level, and thus his ranking his dropped outside of the top 100. Verdasco went just 29-26 for his part in 2016, but should be slightly better than Pospisil to start the season. Goffin over Verdasco is my pick to reach the quarters. Veteran Ivo Karlovic, now 37, went 32-24 in 2016, while his first round opponent Illya Marchenko broke through at the ATP level in 2016 posting a 26-28 record overall. Karlovic’s serve should be enough to get him past his round 1 match, and into the quarters after he defeats 20 year old Karen Khachanov, who opens with local wild card Mubarak Shannan Zayid. Khachanov reached the ATP level in 2016 with a 50-27 record overall. Goffin over Karlovic is my pick for the quarters. Goffin, Djokovic, Murray, and Berdych/Tsonga look safe to reach the semifinals, but of those four spots, Goffin is the most vulnerable to an upset. Khachanov made big strides in 2016 and Karlovic is beatable if his first serve percentage is off. Getting past Karlovic and Goffin won’t be an easy path, but perhaps the Russian can make some headlines to start the season. It’d be an unlikely result if the world #1 and #2 fail to reach an ATP final to start the season, as they prepare for the Aussie Open. Murray triumphed over Djokovic late in 2016, and for now I have to predict that momentum will continue in this tough to predict matchup. 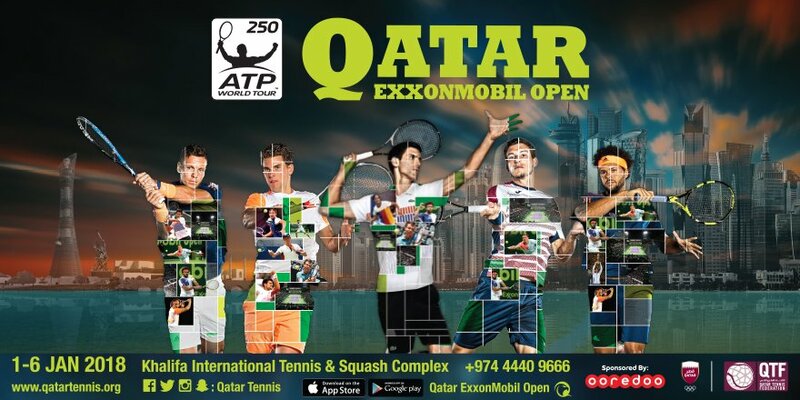 The richest stop on the ATP tour this week is in glitzy Doha, Qatar as many of the top players will stop off in the Middle East for a hard court 250 before heading down under and continuing their Australian Open preparations. Doha is quite top heavy with four top 10 players, and then a big drop off in ranking as the top seeds should be at an advantage this week. Verdasco had his worst year in quite some time on the ATP Tour in 2015 going 24-26 as the Spanish lefty appears to be burning out at 32. This year is crucial for his career, and if he gets off to a poor start he may not be sticking around main draws for long as he’s dropped to #49 in the world. To get himself back in form he’ll need to win matches like this against the wild card Jaziri who was a mediocre 12-20 at the ATP tour level last year, but still had his best ever year on tour and showed flashes of shotmaking ability well above his journeyman status and ranking of #103 presently. Verdasco should win this but he could be rusty. Mayer has a hard court h2h win against Becker, but this match is far closer than the respective rankings of these veterans would suggest. Mayer has been average on hard courts historically, and Becker, when healthy, can serve and attack effectively to post quality results. The German struggled with back problems last year, and at 34 he’s not getting any younger. Mayer is the favorite but the qualifier continuing his good form for an upset would not shock me. Klizan is ranked in the top 50 but he was below .500 at the tour level last year and was relatively unimpressive on hard courts. The Slovak still has the ability to hit with power, but he struggles with consistency and keeping the ball in play. Edmund is a rising young Brit who is just outside the top 100 at 20. He’s 2-12 in his career at the ATP main draw level, but you have to assume those results will start turning the corner soon, and they could do so in this match. The Italian veteran Seppi, who plays with a lot of variety in his game, has won two close matches with Berankis, and on this surface this match has some intrigue to start the season. Seppi started the year off hot last season, but crumbled down the stretch and finished just 26-25 overall, while securing a ranking inside the top 30. Berankis remains talented but underachieving at 25, he had a career high 12 tour level match wins last year, but still finished under ,500 at that level. The undersized ball striker could catch Seppi by surprise if he’s rusty, but the seed is the favorite. After an incredible 2015 where he posted an 82-6 record, and won almost every marquee tournament, Novak Djokovic is going for an even better encore act in 2016. He can start the year off right by adding another trophy to his storage unit of trophies with a title in Doha. The world #1 will open with the exciting Dustin Brown, who qualified and would love an opening round upset of epic proportions. Brown has been able to play a considerable number of ATP matches over the past two seasons, and though he was under .500 against last year, you never know what you’re going to get with his serve and volley game. Djokovic should advance however and then ease past the Verdasco/Jaziri winner. The Becker/Mayer has the inside track to post an early ATP quarterfinal as their round 2 opponent will be either Pablo Andujar or Paolo Lorenzi, both of whom prefer clay. After Brown, nobody should be able to stop Djokovic before the semis, and I have Mayer in the quarters before falling to Djokovic. Tomas Berdych should also be untroubled before the quarterfinals, he’s defending finals points from last season at this tournament. Berdych is 6-0 in his career against his opening round opponent Sergiy Stakhovsky, the Ukrainian unable to handle his baseline power after a 20-25 ATP main draw record last season. Berdych went 57-22, his most wins ever in an ATP season. Berdych should ease past Damir Dzumhur or Marco Cecchinato in round 2, with Dzumhur a better hard court player than the Italian. Look for Berdych to face another serve in volleyer, Feliciano Lopez, in the quarterfinals. Flopez ended 2015 with a 32-26 record, one that was comparable to his 2014, along with a top 20 ranking. The Spaniard will face his countryman, journeyman Daniel Munoz de la Nava in round 1, and then the Klizan/Edmund winner. Presuming the Spanish veteran can continue his hard court success from previous seasons, it’ll be a Berdych vs. Lopez quarterfinal with Berdych holding a 4-3 hard court h2h edge, and having won the previous two meetings. Berdych can play bad matches at times but he’s the favorite for the semis. 2014 Doha champion Rafael Nadal is looking for a 2016 that is far better than his 2015, where he lost more matches (20) than he had in any previous ATP season. Nadal showed signs of turning the corner, after playing below top 10 level for parts of last season, when he finished strong on the Fall swing. This tournament is another form check for Rafa in advance of the Australian Open, in regards to how vulnerable he is to an upset. His first opponent, countryman Pablo Carreno Busta, is not the type of upset him, though PCB showed improvement on hard courts in 2015. Nadal should also cruise past either Robin Haase or qualifier Aslan Karatsev. Karatsev has limited ATP experience, while Haase once more disappointed at the ATP level with a sub .500 record in tour matches. Nadal should be pleased with his draw as the Berankis/Seppi winner is also a good matchup for his defensive baseline game in the quarterfinals. Berankis/Seppi will face either Marsel Ilhan or Andrey Kuznetsov in round 2. Both players were poor at the ATP level last season. Nadal over Seppi is the most likely result in the quarters. Nadal is 6-1 in the career h2h vs. Seppi. David Ferrer had his fewest ATP losses since 2012 when he posted a 53-16 record in 2015, and continued to defy his doubters with another top 8 season at 33 years old with his grinding style of play. Ferru is the defending champion and opens with journeyman Ilya Marchenko in his first match. Teymuraz Gabashvili or Simone Bolelli will be his round 2 opponent. Gabashvili is 2-0 on hard courts against the shotmaker Bolelli, who had a better ATP record than the he did in 2015. Both can play great tennis, and have their peaks and valleys. I have Bolelli winning his first match and then falling to Ferrer who he is 0-6 against. Ferrer is 2-1 against Gabashvili. #7 Seed Jeremy Chardy could trip up in round 2 if he doesn’t tune his game up after drubbing local wild card Mubarak Shannan Zayid in round 1, who is at a level below most ATP hitting partners. Albert Ramos and Paul-Henri Mathieu will vie for the right to face him round 2, as Ramos was stronger at the ATP level last season but Mathieu with his baseline ball striking can play crafty veteran tennis at times. Presuming Ramos top spin is working he should test Chardy who was an even 28-28 last season. Chardy usually operates under the radar in tournaments and I do have him reaching another quarterfinal in subtle fashion. Ferrer will be looking for revenge against Chardy after losing to him at the 2015 US Open. Ferrer dominates the overall h2h 7-2 and should extend that to 8-2 in reaching the semifinals, though Chardy’s deceptive game could surprise. It would be a good showing for the unseeded Berankis to get past Seppi and Ilhan/Kuznetsov to reach the quarterfinals and get an upset shot at Nadal. Berankis has always had the talent and this needs to be a breakthrough year for him, similar to the type of success David Goffin, a player of similar style and stature, was able to have last season. Nadal won both his meetings against Ferrer last season and Djokovic is 6-0 against Berdych over the past two seasons, thus both of the top seeds have a clear edge to reach the final. It’s also worth noting that Nadal just beat Ferrer in a hard court exo in Abu Dhabi, an exo that he won. The tournament organizers would love this final and they will probably get it. The h2h is 23-23 between the legends but Djokovic swept Nadal last year (4-0) and has also won the last four hard court meetings. Nadal knows how to beat the world #1, and he still has enough belief to do it, but Nadal would need to play a flawless match to defeat Djokovic.